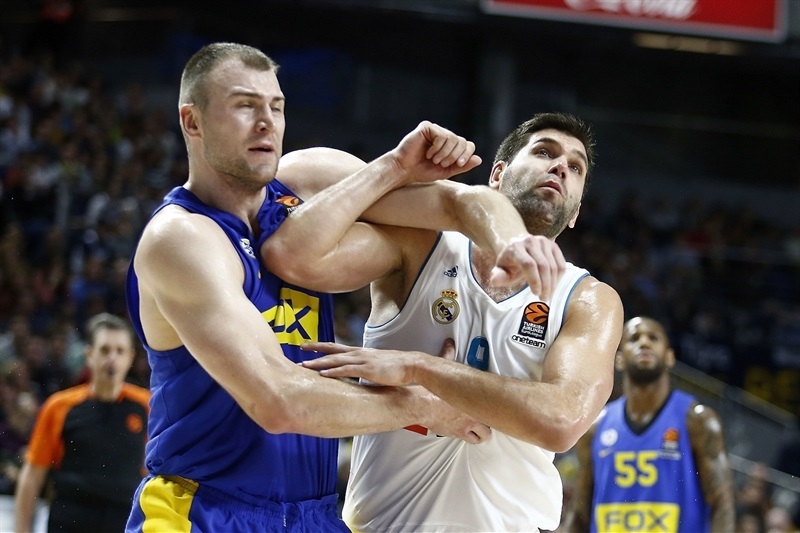 In a showdown between classic Turkish Airlines EuroLeague powerhouses, Real Madrid grabbed its fifth consecutive win in the regular season by downing Maccabi FOX Tel Aviv 93-81 in the Spanish capital on Friday. 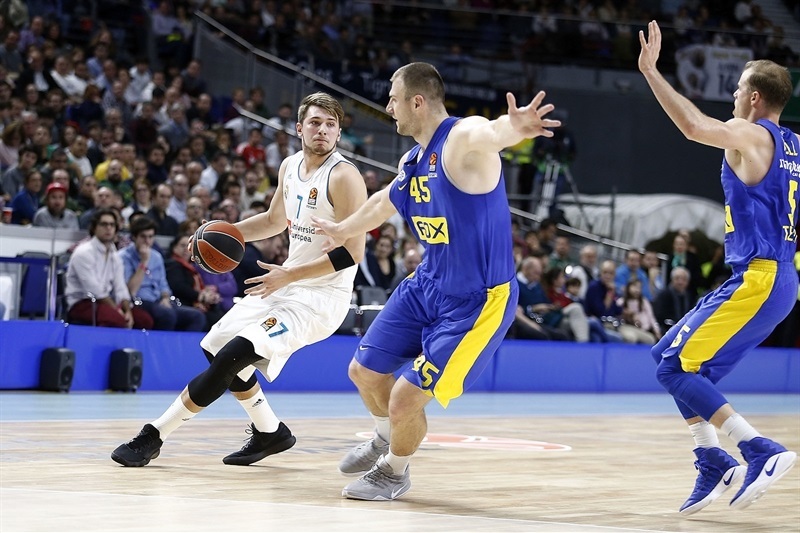 Madrid improved to 10-6 in the standings while Maccabi dropped to 8-8. 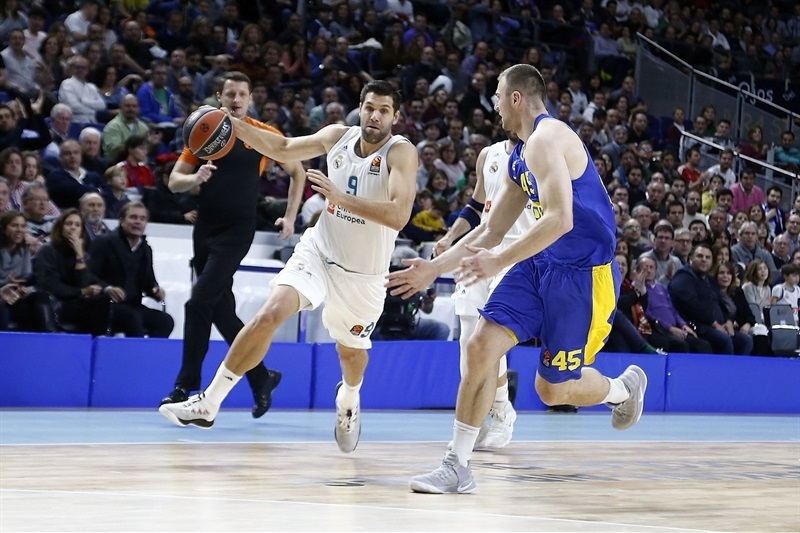 Felipe Reyes led the winners with 14 points. 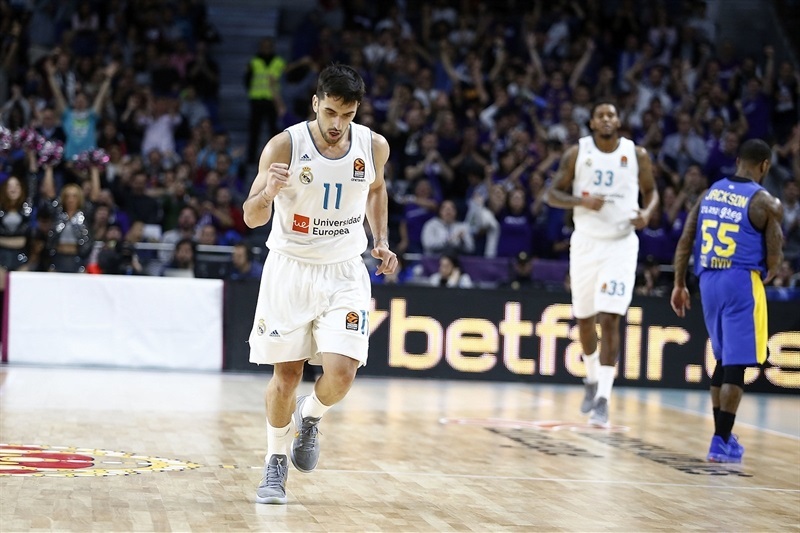 Facu Campazzo added 13, Luka Doncic got 11 while Trey Thompkins and Walter Tavares each had 10 for Madrid. Tavares added 12 rebounds for a double-double. 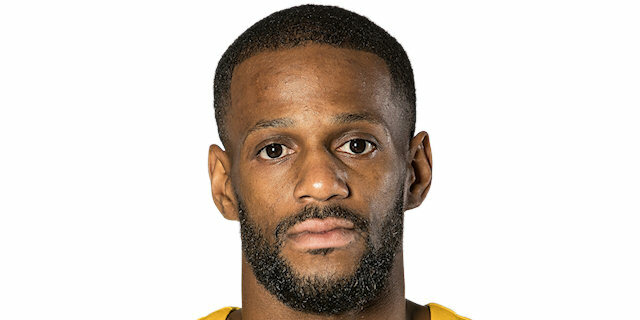 Pierre Jackson led Maccabi with 29 points. 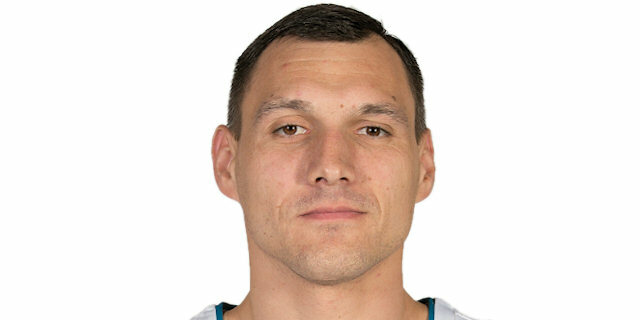 Art Parakhouski scored 16 for the guests. 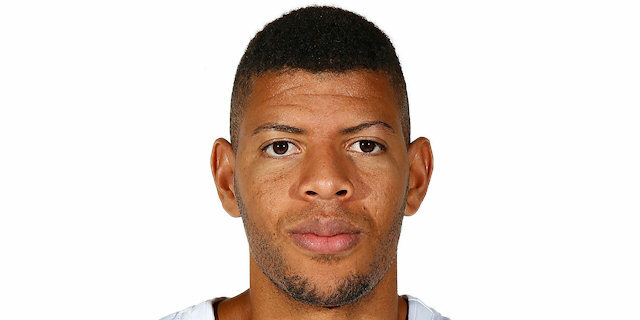 Jackson struck three times from downtown and Yovel Zoosman added two more to give Maccabi a 15-26 margin late in the first quarter. 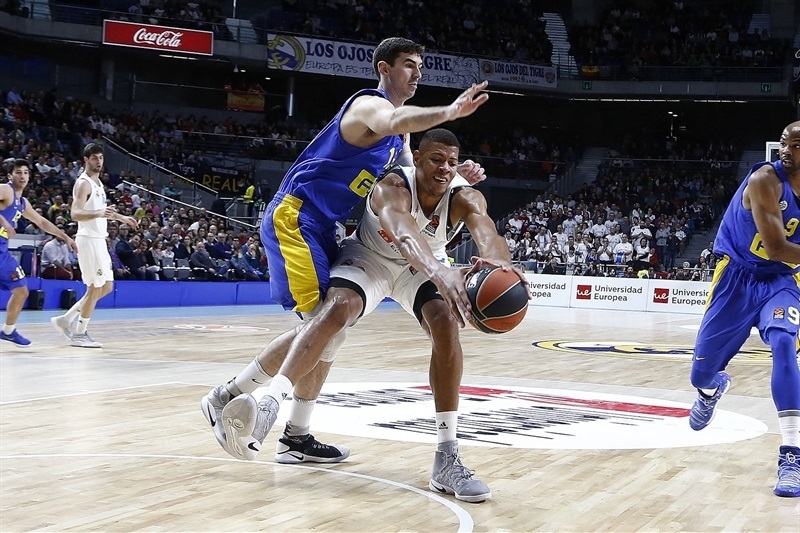 A 12-0 run which Tavares capped with a jump hook gave Madrid its first lead, 27-26, early in the second quarter. Jackson and Parakhouski kept pacing Maccabi and DeAndre Kane followed a layup with a three-pointer for a 48-50 score at halftime. 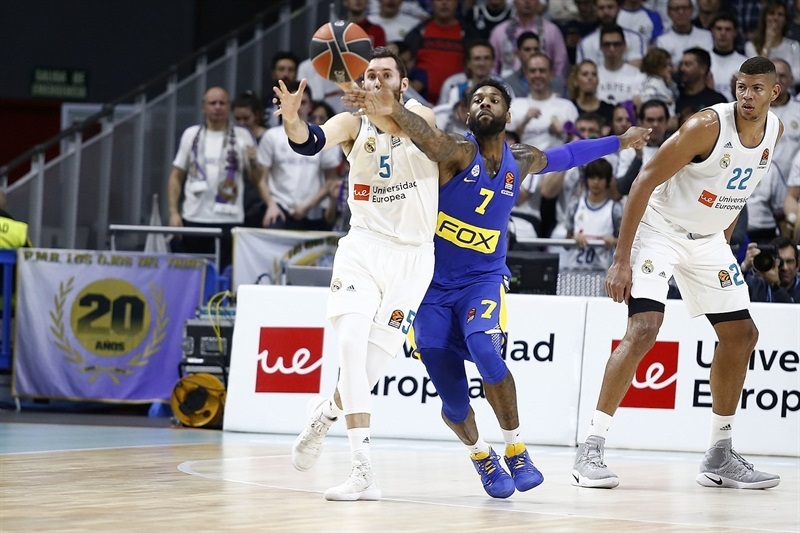 Thompkins, Campazzo and Jaycee Carroll combined for all the points in a 15-0 run that put Madrid ahead for good, 67-54. 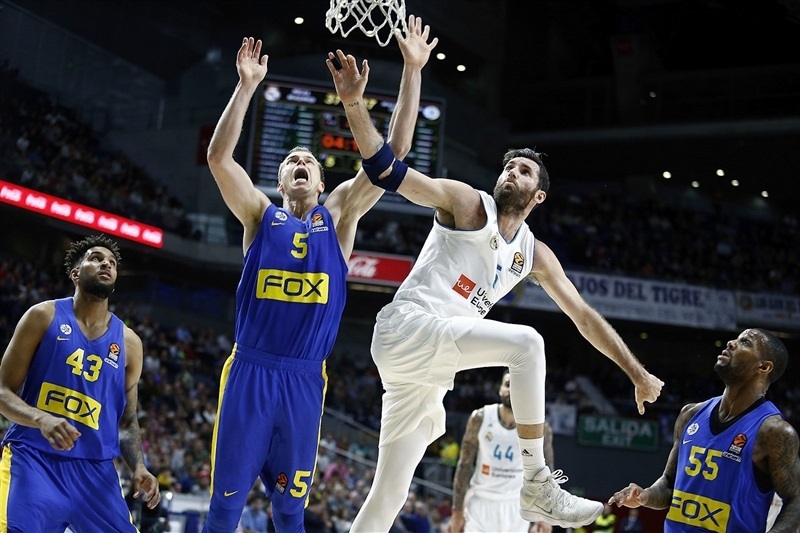 Maccabi kept trying but another 13-0 run that Rudy Fernandez capped with consecutive three-pointers allowed Madrid to seal the outcome, 82-62, minutes before the final buzzer. Three-pointers by Jackson, Jonah Bolden and Zoosman allowed Maccabi to get an early 4-11 lead. Santi Yusta followed a jumper with a triple, Campazzo hit a floater and Fabien Causeur added a driving layup but an unstoppable Jackson struck twice from downtown for a 13-19 Maccabi margin. Zoosman sank his second triple, Parakhouski added a jumper and a close basket by Michael Roll made Madrid call timeout at 15-26. 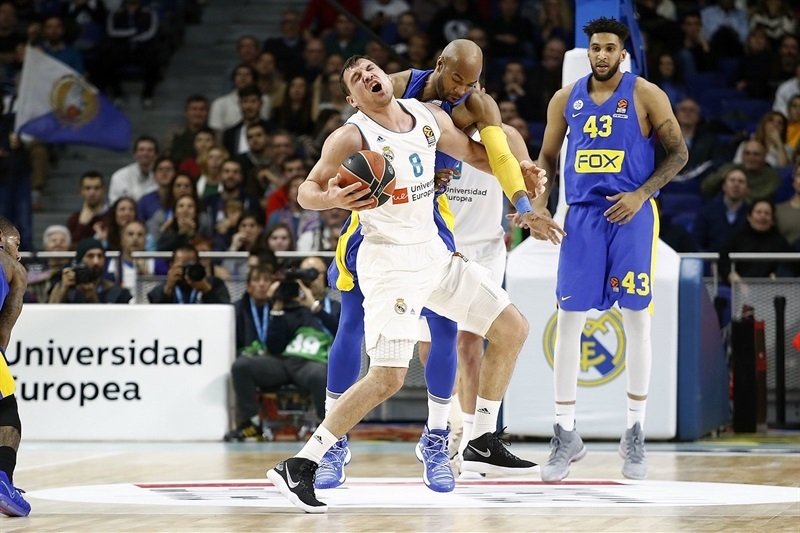 Causeur and Thompkins joined the three-point shootout, Campazzo hit a jumper and a driving layup by Causeur got Madrid within 25-26 after 10 minutes. A jump hook by Tavares capped a 12-0 run and gave Madrid its first lead, 27-26, early in the second quarter. Alex Tyus and John DiBartolomeo made free throws but a three-pointer by Doncic and a coast-to-coast layup by Reyes made Maccabi call timeout at 33-30. Parakhouski scored down low and Jackson followed a three-point play with a driving layup for a 37-37 tie. 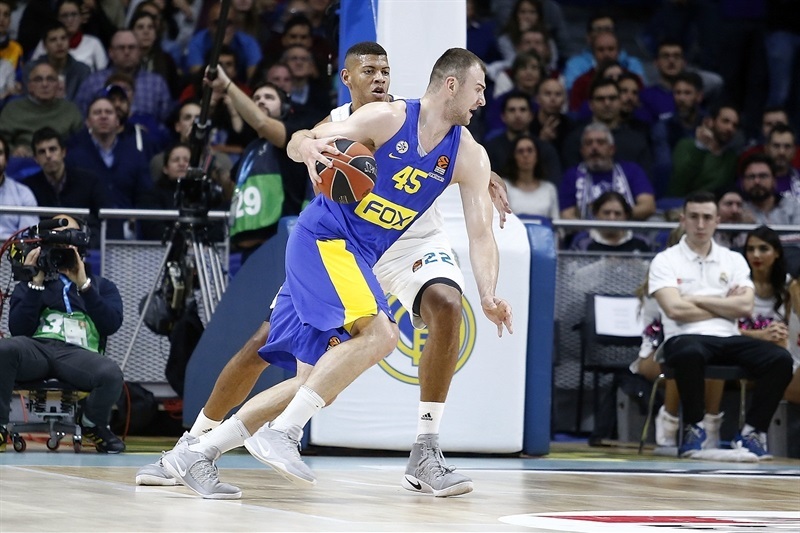 Reyes kept pacing Madrid with a jumper and a layup and Jonas Maciulis struck from downtown but Kane and an unstoppable Parakhouski made Maccabi regain the lead, 44-45. Doncic hit free throws and a jumper but Kane followed a layup with a three-pointer for a 48-50 Maccabi lead at the break. 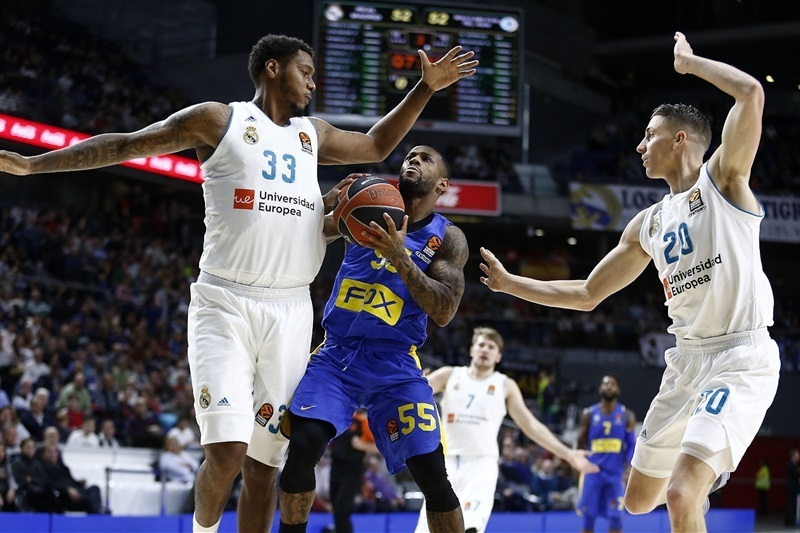 Tavares dunked after the interval, Doncic added a jumper and three-pointers by Thompkins and Campazzo forced Maccabi to stop the game at 61-54. Carroll stepped up with a floater and followed Thompkins's put-back basket with a layup that broke the game open, 67-54, after a 15-0 run. Tyus rescued Maccabi with a jumper and a layup and Roll scored in the paint, but free throws by Reyes fixed the score at 69-60 after 30 minutes. 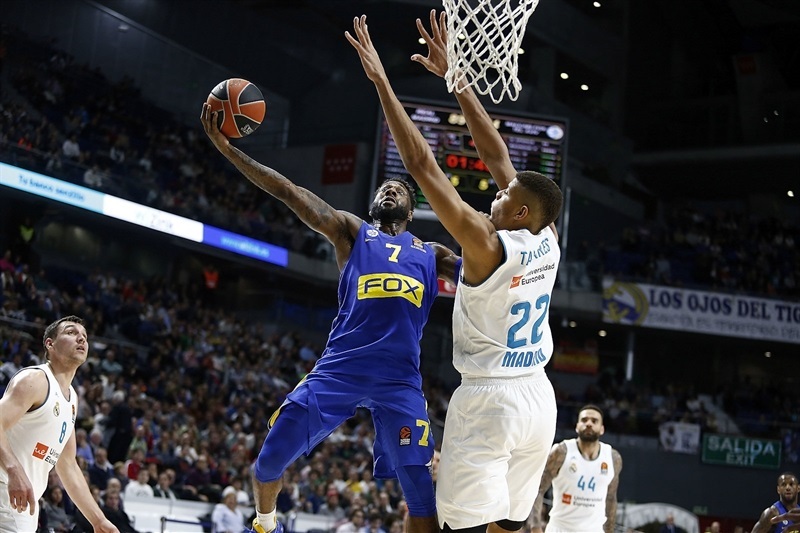 Jackson hit a jumper early in the fourth quarter but Reyes followed a layup with free throws, igniting a 13-0 run in which Campazzo nailed a triple and Fernandez added back-to-back bombs from downtown to make it 82-62. Maccabi kept trying but it was already too little, too late for the Israeli powerhouse. Both teams return to EuroLeague action next week - Maccabi hosts Brose Bamberg and Madrid visits Khimki Moscow Region. "Both halves were very different. In the first half we were behind them. They hit a lot of shots but we lacked a little bit on defense. I have the feeling they generated a lot from one-on-one situations. We knew they are very dangerous players in that kind of style. After the break, we were able to improve our defense, they were a bit more tired and our rotation allowed us, especially in the third quarter, to get a lead that we managed to keep and increase. Above all, we wanted to keep that lead to get the tie-break advantage. We were not fresh in the final minutes, which is normal, but in general, a lot of players made big contributions in the time they were on the floor. Congratulations to my players for their efforts. In general terms, I see that we had five players in double digits but the feeling that everyone who stepped on court was able to give us something positive. When people think about Carroll, they think about his three-point shots and offensive game, but his defense on Jackson was key for us to change the game's rhythm. He sprained his ankle, so we will see about it. What makes a team great is knowing that everybody is ready to offer things." "We talked at halftime that they cannot score 50 points in one half. I think it was a lot of one-on-one situations and we had to do a little bit more. Of course, it is a team defense but there were situations in which they were one on one. I think we worked hard with our second unit. I think Carroll did a great job on Jackson, trying to shut him down. He really tired him. We did a good job for 40 minutes, increased our defensive level in the second half and our big guys dominated a little bit the game, with Edy [Walter Tavares] and Felipe [Reyes] playing close to the basket. Happy for the victory." 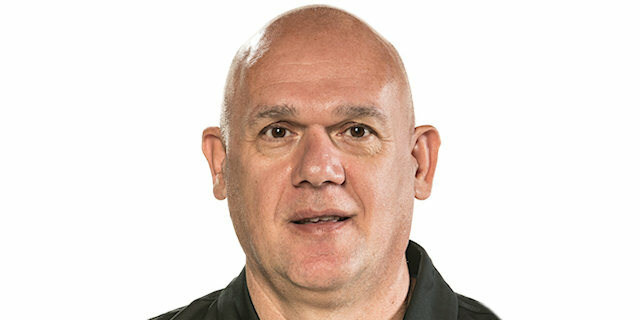 "I would like to congratulate Real Madrid and Pablo Laso for this win. I think they were the better team tonight. They played more consistenly. We had a great first quarter offensively - of course, not defensively, but it was very difficult for us to play 40 minutes with such short rotation we had tonight. 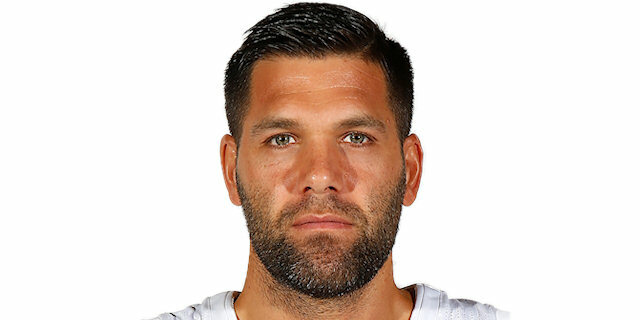 I think that we had one bad moment in the third quarter when we changed our starters and they took advantage of that in the end, and they won the game. They have one of the best rosters in the league, even when they are missing players, they will still be good. That is life in Real Madrid and right now, they are playing really great basketball. We tried but it didn't work and we have to think about the next one. I hope that at least one of my players is going to come back for the next game to try to stay consistent." "Everybody needed a big effort with a short rotation. We know what we have to do on the court and our roles, so sometimes it is better. Everybody knows their role, how we start and how we play and results are better now. We hope to continue like this and improve our game, because we still make mistakes. In the EuroLeague, all victories at home are very important. We lost twice at home in the first half of the regular season, so this win is very important for us. We can't let it happen from now on. We also won the tie-breaker against Maccabi and it is a good start to the year." "We came out very well in the second half, much more aggresive on defense and offense. Thanks to this agressiveness, we pulled out a win that was very important for us. Defense is very important in basketball - when you are able to play defense, run the floor and rebound well, you have more chances to win. We are happy with our second half, not as much as with our first half. We are on our way up, winning our last five games, and we have to carry on like this. We are a team in which anyone can score and that is important. A team that wants to have a chance to win titles has to have players like that, and Real Madrid has them. It is important to have fun when you play, especially at home. If your fans also enjoy it, even better." "The second quarter was the key - we came out with more energy, better than in the first quarter. We guarded them better on defense and played with energy. That was the key. We protected our home court and tried to make it hard for them to score."